Not just what you need, but also why you need it! Read the review from General Aviation News! Now you can completely master the E-6B Flight Computer quickly, easily, confidently and (almost) painlessly. Why let this simple, useful device stand between you and your pilot's license? It is all here: Time, speed and distance problems, Density altitude, fuel required, and the one that always scares student pilots (and often licensed pilots) absolutely silly, wind triangles! There's more, too: True airspeed (and an easy way to find it), True altitude, conversions between nautical and statute miles, conversions between US Gallons and liters (and also Imperial Gallons), conversions between pounds and kilograms, and conversions between Fahrenheit and Centigrade. More important, you'll learn how to fit all the pieces together when you plan a flight. Everything is shown in clear, simple step by step procedures, not just "do this" but also the WHY behind the "do this". The author, Mike Arman, is an FAA certified Advanced Ground School Instructor, and has been a pilot since 1978. He has taught over 2,000 people to use the E-6B in the past eight years, and every one of them survived the lessons. 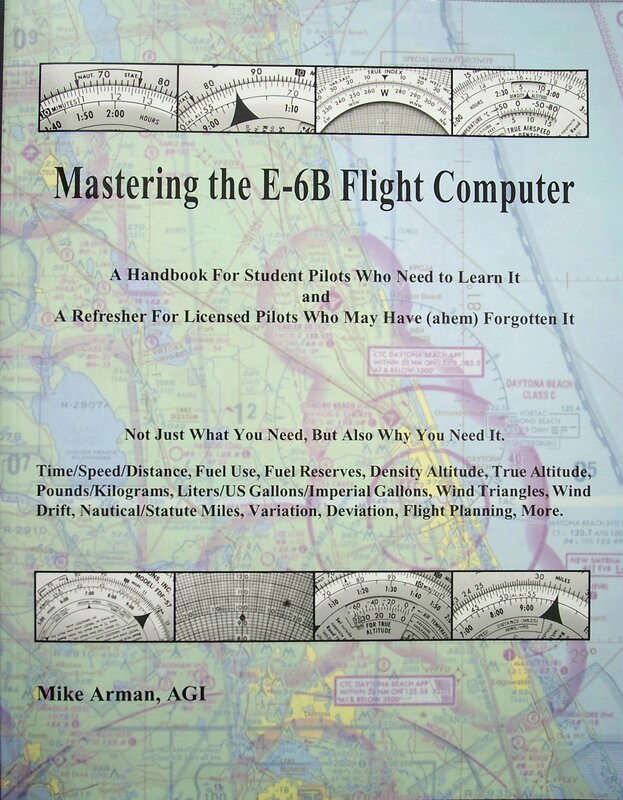 Mastering the E-6B Flight Computer is 80 pages, 8.5 by 11 inches, and has 56 illustrations. If you are a student pilot, you need this book! If you are a licensed pilot and have forgotten how to use the E-6B (tell the truth, now), you need this book. If you are a ground school instructor (FAA, CAA or JAA), your students will thank you for telling them about this book. Mastering the E-6B Flight Computer costs just $23.95, and it will save you hours and hours of frustration, anxiety and exasperation. Don't put it off, if you wait until the day before your written test or flight test, that's too late! Click this link to return to home page.